Another quarter, another rainbow-coloured Marvel poster. Film 17 in the franchise doesn’t break any new ground, but it’s a step up from the first of their 2017 releases. Taika Waititi has yet to make a bad film. Here’s he’s effortlessly become part of the Hollywood machine whilst still retaining his directorial voice. The third Thor outing sees the God of Thunder attempting to avert Ragnarok, finding himself on an alien planet and settling yet another family squabble. Cate Blanchett’s Hela should be the most significant new character, but she’s not at her best here. Much like Indiana Jones and the Kingdom of the Crystal Skull, Blanchett on villain duties comes across as…a little tacky? I’m sure we can’t lay the blame at her feet – after all, the script gives her very little to work with – but all the same, she looks more like a Power Rangers villain that anything else. In comparison, “Dear White People’s” Tessa Thompson very nearly steals the show as Valkyrie. This is someone I’m excited to see in further sequels. Jeff Goldblum is having a fun time, but his character doesn’t go anywhere, whilst Karl Urban is good value, as always. 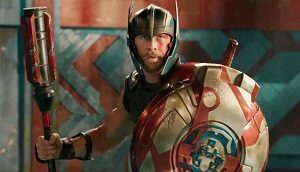 As far as action comedies go, Thor: Ragnarok is doing what Marvel movies do best. I do wish they’d aim for some more serious moments, however. Guardians of the Galaxy Vol. 2 had the unfortunate habit of undermining every potentially emotional moment with gags, and whilst this film isn’t quite that bad, there are certainly some missed opportunities. If it’s all jokes all the time, there’s no reason to ever worry about the wellbeing of our heroes. There is some really shoddy VFX work here, and some incredible moments too. Marvel need to get their act together – their movies are some of the most inconsistent Hollywood productions, visually speaking. There are some beats where the CGI effects look great, but then they’ve just plonked some flesh-and-blood actors in the middle of it, and don’t seem concerned about concealing the seams.